Spring is here, or at least sort of. We’ve had 17 straight days of rain, finally followed by one sunny day that was decent enough to migrate from the treadmill to the streets. The daffodils were blooming and everything was greening up, and then we got the April Fools’ joke of snow. 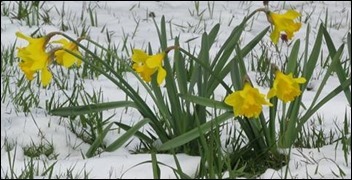 Still, the transition to spring is a good one and hopefully the snow won’t stay around for long. Watching the outdoors perk up tends to give people energy to take on new projects and embrace new things. In that spirit, I’m going to offer some challenges to the healthcare IT leaders out there. Look through your library of applications and find a feature that you’re not using but that might benefit your users. Maybe it’s a feature that you didn’t need at the time it was created, so you didn’t implement it. Since then, your business might have changed, or maybe healthcare in your community changed, and it might be a good thing to roll out now. We also see organizations not implement features because they’re forced to upgrade on a specific timeline and don’t have time to address everything that comes with a new release. If you’re really nervous about rolling out a feature, consider piloting it, perhaps selecting one clinical division or practice location to use a new feature. This allows you to not only complete a proof-of-concept exercise, but to ensure your training and implementation approach is solid before you roll it to the rest of your organization. Although sometimes we will see a failure, in most cases new features that are carefully rolled out will be embraced and can save end users time and frustration. In addition to user personalization features, other features we often see put on the back burner: e-prescribing; e-prescribing of controlled substances; real-time eligibility checking; patient portal appointment scheduling; online statements and bill pay; secure messaging; clinical decision support; and condition-specific documentation favorites. Review your policies, procedures, and processes and find one that isn’t required and doesn’t add value, then eliminate it. In observing clinical workflows, I often find data collection points that aren’t used and no one questions why they are gathered. Maybe it was a grant that your practice had three years ago that wasn’t renewed; maybe the data is now automatically fed from another system (such as registration or the bed board system) and no longer needs to be collected separately in the EHR. I often suggest that organizations review their patient intake forms and look for redundancy. At a recent physician office visit, I was asked to write my pharmacy information on three separate sheets of paper. It was clear that the office had evolved their intake forms, but had done so in a siloed fashion. The “front desk registration sheet” asked for it, the “clinical history” sheet asked for it, and they “why are you here today” sheet asked for it. For a returning patient where only the “why are you here today” sheet might be filled out, that might make sense, but for a new patient filling all three sheets out, it was a bit much. Not only does asking for data multiple times irritate and inconvenience your patients, but it increases the risk of error as people are overwhelmed and are copying information multiple times. In a typical clinical / financial workflow analysis, I usually find close to a dozen processes that could either be eliminated or benefit from significant streamlining. Processes that can be eliminated often grow from distrust of electronic systems. For example, making patients verify paper copies of their history forms even though they just filled them out online within the past 48 hours and already electronically attested to their accuracy. Or making patients completely fill out new patient paperwork annually rather than printing them a copy of their current information and asking them to confirm and update. Other processes might be unrelated to patient flow but important to business. I see a lot of waste in processes that organizations use for shift scheduling, time-off requests, expense reimbursement, and more. I also see a lot of policies that are “required by HIPAA” or “required by OSHA” that are truly nothing of the sort. Make sure if something is “required” that it really is, unless you want to be called out on it. Spend time as a leadership group reviewing organizational values. There are a lot of mission statements and vision statements out there, but in many cases, they are so remote from day-to-day business operations that they’re not having any influence on how people work or how they interact with patients or other clients. I still remember the mission statement of my first EHR project at Big Medical Center – probably because we actually believed it and lived it on a daily basis, rather than just seeing it posted in the hallway or once a year in some slide deck. If your vision has gotten hazy or cloudy, maybe it needs an update. If people don’t know what the mission is, then your corporate culture might need some attention. Organizational values should be more than just a plaque on a wall somewhere. They’re more than a logo or brand statement. Values should be easily understandable and should guide the actions of people doing business whether with internal customers, patients, family members, or anyone else. If you find people in your organization conducting themselves outside of the values, be open to addressing it rather than taking the easier road of letting it go by or being glad it’s not happening on your team. Spring is here and it’s a great time to make a change. Is your organization up to the challenge? Leave a comment or email me.